Give us an idea of your average breakfast, lunch and dinner? Breakfast is always a yoghurt, fruit and granola during the week – eggs in some form for an indulgent weekend brunch. Lunch I steer towards salads or Gluten free crackers with some cottage cheese and tomato. Dinners normally comprise of a protein like chicken breasts or salmon with steamed vegetables or salads. You feel like some bread, what is your go to type? I will always be a sourdough supporter, I love the soft flavourful bread and caramelised, chewy crust. Let’s be honest, Pizza is life. What toppings are you going with? I am a big sweet & salty fan – so ham and pineapple is my go to with avocado of course. If I’m New York – always pepperoni. What is the thing you know is a luxury but splurge on when buying groceries. The Norwegian Salmon Hot Smoked with Pepper & Dill from Woolworths – I find it hard to resist popping one in my basket, despite the price! It’s just so delicious and perfect to add to salads or even eat on its own if I need lunch on the go. Being a Knysna local, I thought it would be great to share a market I have grown up with. 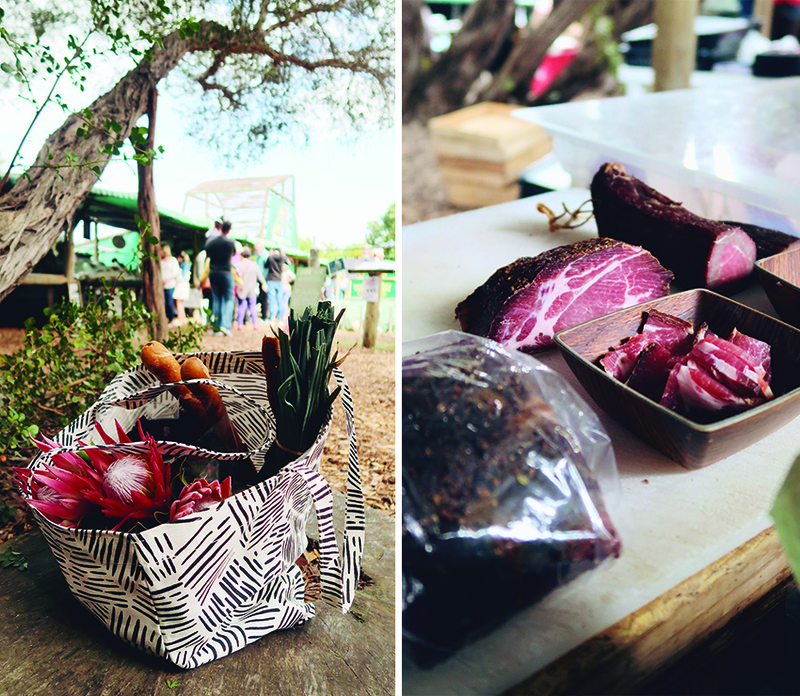 Humble as it may be, the Wild Oats Market in Sedgefield has some great produce on offer. Every Saturday locals from the Garden Route flock toward the sweet pancakes and hot coffee. The Wild Oats Market has operated whether rain or shine for the last 20 years. As a private chef I am always making shopping lists when cooking for my clients, so when shopping for myself I like to just wing it, although I am a firm believer in a good shopping list! You save money and time at the store. I headed out with my new Zana shopper in hand, ready to pluck the freshest, most appealing produce from eager and invested purveyors. The first stop is always Petals Protea Nursery for some of the best proteas and indigenous plants you can find – it is hard to resist the explosions of pink and orange as you begin your organic treasure hunt. I always do a reconnaissance of the market that day and eye out my favourites. As a family, our preferred way of eating is always in the form of tapas, allowing us to enjoy so many different flavours in one meal. I am a great fan of creating things from “leftovers” and things that need to be used up – I don’t support food waste! 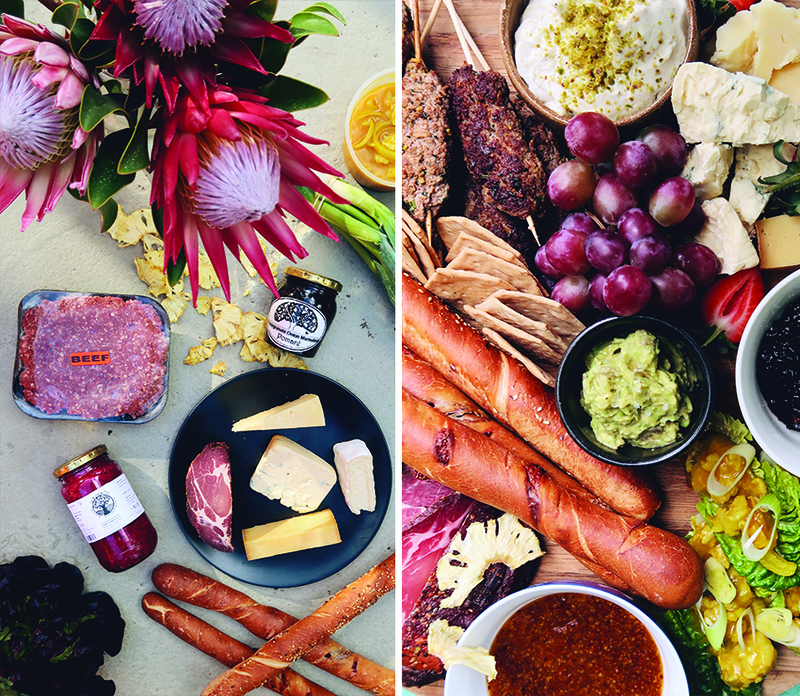 Therefore my plan was to purchase ingredients that I could create a delicious platter of market goodness, whilst including some bits and pieces from home, in the fridge or pantry. I always start with the foundation first, bread! 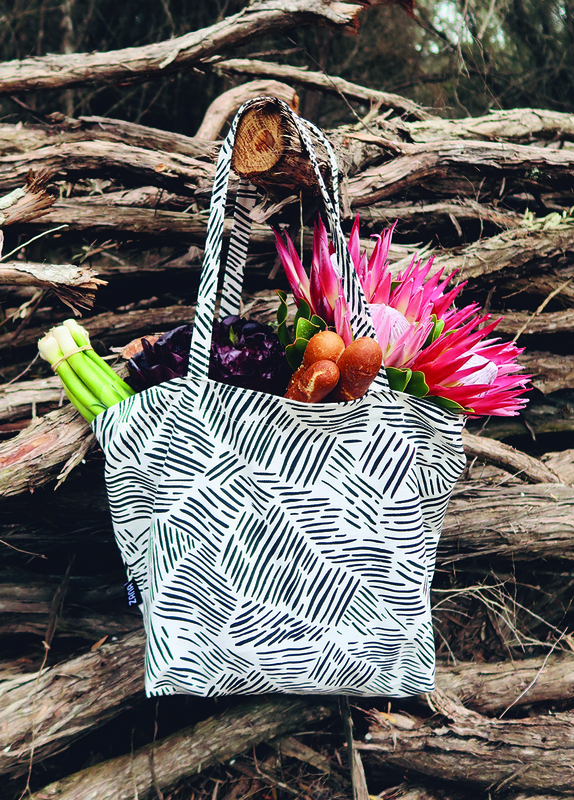 I sniffed out some crispy breadsticks and made them mine, next the healthy stuff – a living lettuce and juicy spring onions were added to my new crisp Zana shopper. Then onto proteins; cheese obviously and some free range, farm ground beef. I had passed some pickled fish on they way in and doubled back to claim a tub. I had a need for cured meat and stumbled upon a stall manned by a German gentleman, who home cures his pork & beef. I had a nibble at the options and settled on the smoked pork neck, it was delicious, and I knew I had something great at home in the fridge to pair it with. I needed some form of relish to plateau my creamy cheese, I picked out a perfect pomegranate and onion relish and a beetroot sauerkraut. Dried pineapple chips, to snack on in the car would mark my final acquisition. By the time I made it home it was time for lunch. I chose the wooden board for the job and began plotting my assault on the ingredients I had gained. Having tahini, yoghurt in the fridge and pistachios in the pantry – Beef koftas came to mind. I shaped my beef koftas on wooden skewers and placed them to one side while I created the rest of my tapas. The fresh lettuce worked perfectly as ‘boats’ for the pickled fish, the spring onion finished this off well. I had an apricot mustard in the fridge that paired well with the smoked pork neck and scattered some left over dried pineapple as an accompaniment. 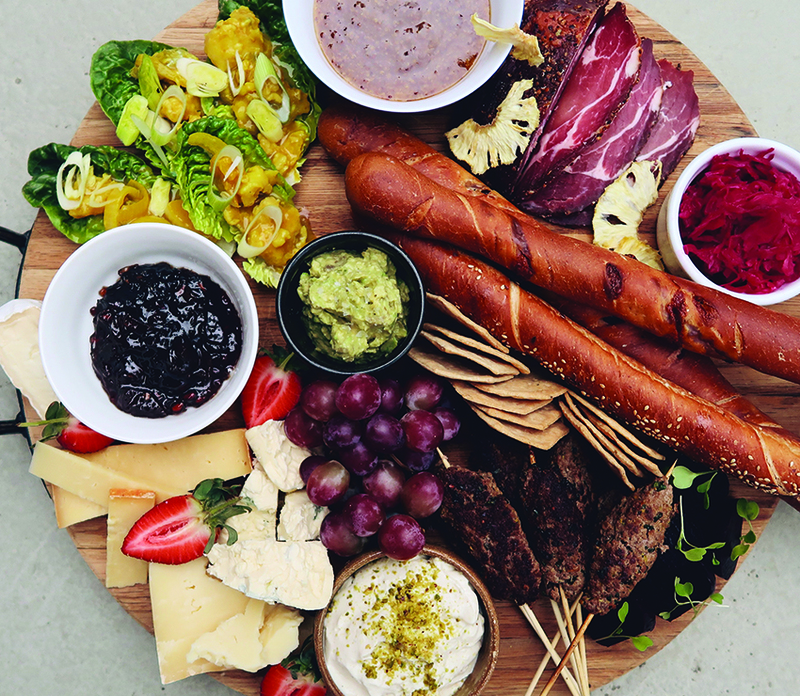 Putting together the platter is my favourite part – grapes, strawberries, gluten free crackers were some necessary additions. Half an avocado was turned into guacamole and roasted beets quartered and dressed in olive oil. I add my grilled koftas and tahini yoghurt to a bowl, sprinkled with some pistachios and my lunchtime tapas board was ready to be devoured. Soak wooden skewers in cold water (this prevents them catching alight during cooking). Place the beef mince in a bowl with the thyme, chili, cumin and sumac, a little salt and pepper and all the pistachios. Heat a griddle pan till smoking, brush with olive oil and place skewers on, turning frequently until browned and cooked through. Drizzle with olive oil and a squeeze of lemon and serve with a tahini yogurt. 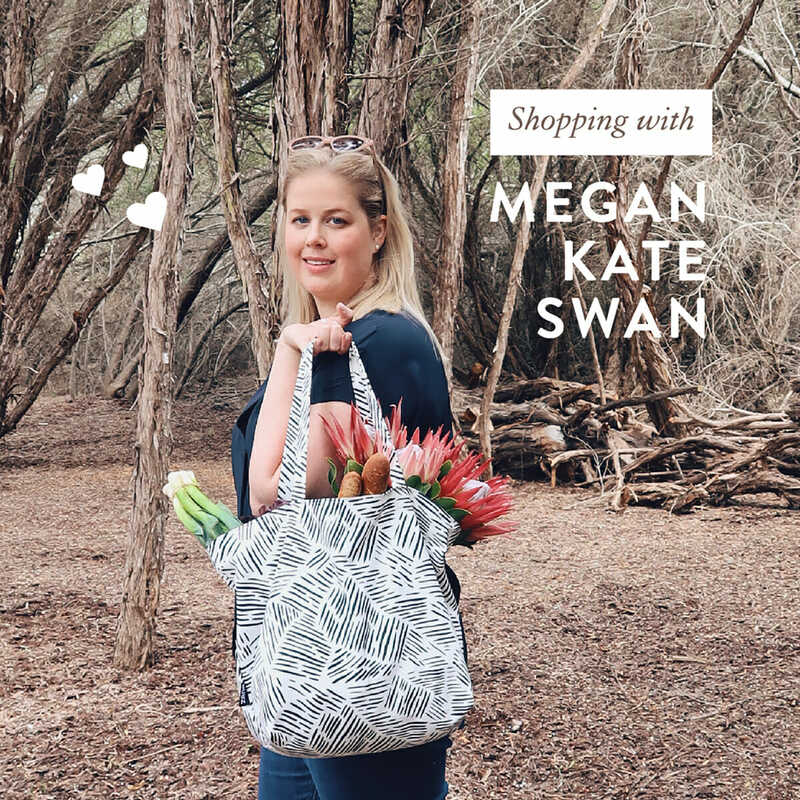 Thank you so much to Megan for collaborating with us on this post. Follow Megan on Instagram here. Buy your very own Shopper ready for your market adventures here. Megan is the not only one of the best chefs, but she brings such a passion and love for her craft which one can taste in every morsel she creates. Truly a gem or a person and a natural when it comes to preparing the most divine meals! Thank you Megan! !